Marvel Entertainment, LLC, a global character-based entertainment company, and Aéropostale, Inc. (NYSE: ARO), the parent company to children’s retailer P.S. 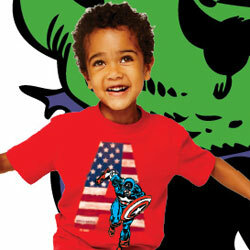 from Aéropostale®, today announced an exclusive collection of Marvel Super Hero merchandise available under the P.S. from Aéropostale brand. The apparel and accessories line will be targeted to P.S. 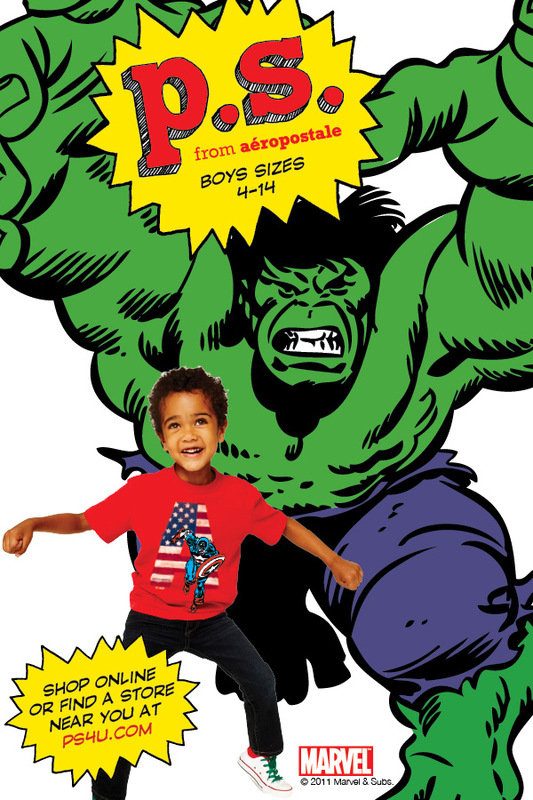 from Aéropostale customers, kids ages 4 to 12 years-old and will include designs inspired by classic Marvel Super Heroes such as Spider-Man as well as next summer’s blockbuster film event Marvel’s The Avengers which features Iron Man, Captain America, Thor, The Incredible Hulk, Black Widow and Hawkeye. The initial product including t-shirts, hoodies and accessories will debut this October in P.S. from Aéropostale stores across the U.S. and online at www.ps4u.com. Additional apparel and accessories will continue rolling out in support of Marvel’s The Avengers in theaters on May 4, 2012. P.S. from Aéropostale will be supporting the Marvel Super Hero collection with an integrated marketing and promotional campaign which includes in-store displays, social media outreach, a Super Heroes shop at ps4u.com and character appearances in several of its P.S. from Aéropostale stores on October 15th. Aéropostale, Inc. is a mall-based, specialty retailer of casual apparel and accessories, principally targeting 14 to 17 year-old young women and men through its Aéropostale® stores and 4 to 12 year-old kids through its P.S. from Aéropostale® stores. The Company provides customers with a focused selection of high-quality, active-oriented, fashion and fashion basic merchandise at compelling values. Aéropostale® maintains control over its proprietary brands by designing, sourcing, marketing and selling all of its own merchandise. Aéropostale® products can only be purchased in its Aeropostale stores and online at www.aeropostale.com. P.S. from Aéropostale® products can be purchased in P.S. from Aéropostale® stores and online at www.ps4u.com. The Company currently operates 916 Aéropostale stores in 49 states and Puerto Rico, 63 Aéropostale stores in Canada and 64 P.S. from Aéropostale stores in 17 states.